Crawford Healthcare's SunSense is the best-selling sunscreen in Australia and the No.1 sunscreen prescribed by dermatology nurses and GPs in the UK. How could we help them take their offer direct to the British consumer without a large marketing spend, low brand awareness and a premium price tag? With most families reaching for familiar brands such as Garnier and Nivea, we needed to identify a more specialist target audience that would align well with the brand’s healthcare credentials. We conducted three qualitative focus groups and telephone depth interviews with specialist dermatology nurses to determine Sunsense’s current position and the best route to market. Research showed those with extreme skin issues (e.g. cancers) and parents of children with sensitive skin were more likely to choose a specialist product. We therefore identified ‘at risk’ skin types and set out to exploit Sunsense’s positioning as a prescription sunscreen. Three distinct audiences were defined: healthcare professionals; highly sensitive/anxious consumers; and purchasers of face creams – all chosen to maximise the potential of SunSense’s anti-ageing face sunscreen. Although the long-term plan is for SunSense to move into mass market, we still had a job to do to position SunSense as a specialist sun care product – then justify its current price point and protect its position as ‘No. 1 Prescribed’. We set about engaging KOLs and ensuring we had the clinical evidence to support and refine the messaging for HCP materials, strengthening credentials as a prescription sunscreen. Sunscreens in Australia need to meet stringent regulation standards. They offer the highest sun protection factor (SPF50+) available and are forbidden from using misleading claims such as ‘waterproof’ and ‘once a day’. We identified and developed a media plan to reach our ‘super niche’ anxious market and used these facts to give them a compelling reason to believe – ‘Australia’s No. 1 Sunscreen’. Finally, we refined the messaging for our ‘UV Face’ creative to strengthen anti-ageing cues and again, justify the price point. Central to the campaign was a new SunSense website with a full e-commerce facility to allow consumers to purchase products online. The website also contained advice and information for patients and professionals, including an area to download copies of our trade and consumer press ads, product guides, infomercial, detail aids and infographic posters. 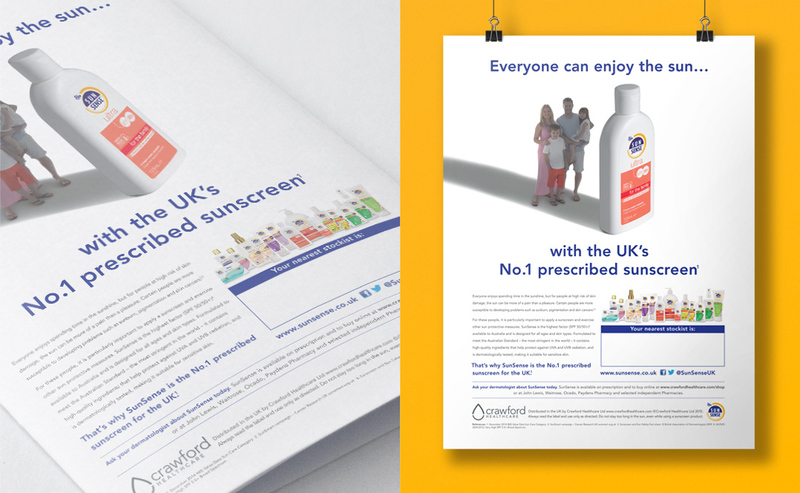 These posters were designed to educate consumers and HCPs on the pros and cons of sunlight, methods of protection, difference between sunscreens, and the benefits of the SunSense range. 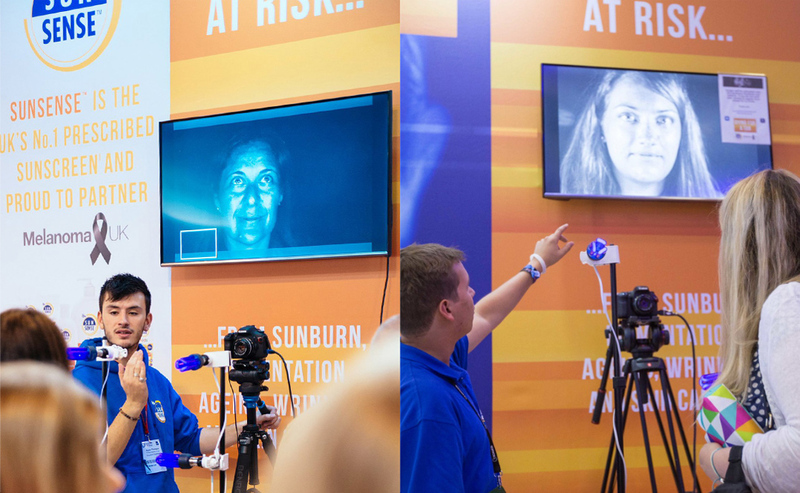 Throughout the year, we helped the SunSense team to promote the ‘Dying for a Tan Tour’, which invited the general public and healthcare professionals to put themselves under an ultraviolet camera to reveal hidden skin damage caused through tanning. Terri Dwyer, former Hollyoaks and Loose Women star, and skin cancer charity Melanoma UK helped to spread the message further, and the launch was supported by a powerful video showing the damage that sun can do.